There’s so much here, I don’t even know where to begin. I won’t be able to write a coherent sort of essay right now about the Ripley Scrolls, as I’m just now wrapping my head around their magnificence. There are 23 copies of the Ripley Scrolls, which get their name from the 15th-century alchemist George Ripley, as snippets of his verses are included on some of the scrolls. Most are thought to have been copied in the 16th and 17th centuries from a now-lost original. The scrolls depict–in what to modern eyes are bizarre and obscure symbols–the process of making the Philosopher’s Stone, the substance thought to impart eternal life and to contain the power to turn base metals into gold. 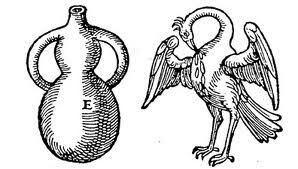 The pelican the alchemist is holding is cut away to reveal the changes the substances are undergoing–but despite the seeming transparency of the cut-away pelican, the changes are cloaked in the arcane system of symbols and riddles that marks the pursuit of alchemy (as you can see below).